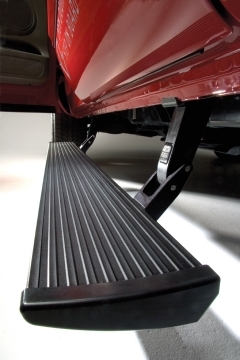 Designed and built exclusively in the USA, the genuine AMP Research PowerStep seamlessly extends when any door is opened, giving a rock-solid, safe and convenient step up into your truck. When the doors close, it retracts just as smoothly, streamlining the vehicle profile with no loss of ground clearance. The original AMP Research PowerStep is proven to perform in severe driving conditions and is backed by a full 5-year/60,000 mile warranty the best in the business. GETTING INTO YOUR TRUCK SHOULDNT FEEL LIKE CLIMBING MOUNT EVEREST. Which is why AMP Research created the PowerStep, the automatic, electric-powered running board that instantly extends when you open your door, and then tucks itself back safely under the chassis when the doors close. When retracted, the PowerStep is essentially hidden underneath your vehicle for improved ground clearance, aerodynamics and appearance. And when extended, it provides a sure, solid, high-traction leg up for you and all your passengers, large or small. Stop climbing. And start stepping up, with the AMP Research PowerStep. The AMP Research PowerStep has been tested and proven in long-term, real-world, driving conditions performing flawlessly in snow, ice, dust, mud and dirt. The lightweight, yet rock-solid running board and rugged die-cast linkage components are crafted in the USA of aircraft-quality aluminum, black-anodized and TeflonÂ® coated for maximum corrosion protection. Precision, stainless-steel hinge points and bearings ensure trouble-free action. And the heavy-duty electric motor is designed and tested to provide reliable, maintenance-free operation for decades. Made in USA The AMP Research PowerStep is designed, engineered and exclusively manufactured by AMP Research in America.